New York brand Vianel produces accessories and has established itself with a simple, straightforward mission to offer beautiful things. The aesthetic of the brand is designed to reflect Downtown luxury and each of the pieces has been crafted so as to feel unique. The accessories are stylish and contemporary but functionality also lies at the heart of the ranges 'it's the ideal marriage of practicality meets style. 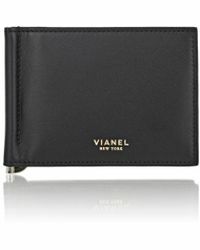 The wallets line from Vianel includes folding cardholders, bifold wallets and vertical cardholders. Each one bears the Vianel New York name and has been crafted in fine leathers with a broad selection of different, modern colours available.